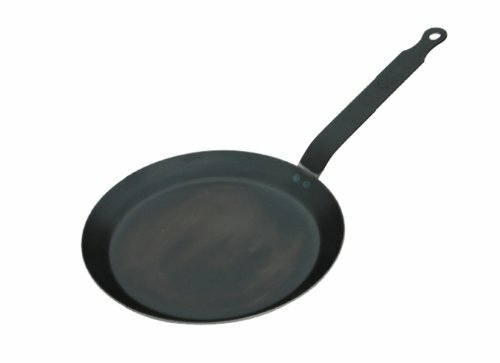 De Buyer’s French Crepe Pan offers the perfect cooking surface for delicate crepes, caramelizing vegetables, and pan searing meat. Made in France from blue steel that’s easy to season and maintain, it builds up a natural patina with use over time for a foolproof non-stick quality with quick food release. Specially designed with a contoured handle to assist in swirling crepe batter to form perfectly thin, delicate crepes. With a cooking surface of 8-inches and overall surface of 9.5-inches, rim to rim, its shallow depth and flared sides allow delicate foods to be flipped and plated effortless without them breaking apart, from crepes to fluffy pancakes and fried eggs. It works equally well for braising meat, poultry, and fish. A great addition to cooking tools for easy, professional-style cooking in the home kitchen. To season before first use, simply wash in hot, soapy water and scrub with a stiffer brush to remove protective wax coating. Dry thoroughly. Add enough cooking oil to cover the bottom of the pan and heat it over medium flame until smoke appears. Carefully discard the oil and wipe the pan with a paper towel. Voila, the pan is now seasoned and ready for use. To clean after each use, hand wash under hot water with a gentle sponge. Always dry thoroughly. Do not use soap, clean in the dishwasher, or scrub with abrasives, as these will spoil the natural patina buildup and its non-stick quality. Never soak the pan, as it could rust. Should rust occur, simply scrub rust away and repeat the seasoning process. Made in France from blue steel.